They taste fantastique, have festivals and religious orders in their name and high prices drive some to murder in the part of France responsible for 80% of black truffle sales. Are we missing something? The scientific name for the black or Périgord truffle is Tuber Melanosporum. It grows mainly on oak tree roots in Southeast France, all across Provençal soil. They have an earthy, musky flavour that is savoured by adding fresh shavings to food, or by preserving the flavour in oil, salt and butter. Prices for the local black truffles range from €600 to €1000 per kilo, and inflation through a combination of time and lack of supply through climate change, means there have been black markets established, and even one instance of murder in 2010. Such an event is unusual for such a warm and communal culture, but more details can be found on The Independent if needed. While the price may seem steep, it still only makes them the second most expensive type of truffle around. White truffle tops it as the most expensive, costing a few hundred thousand more than whatever currency you choose to buy them in. 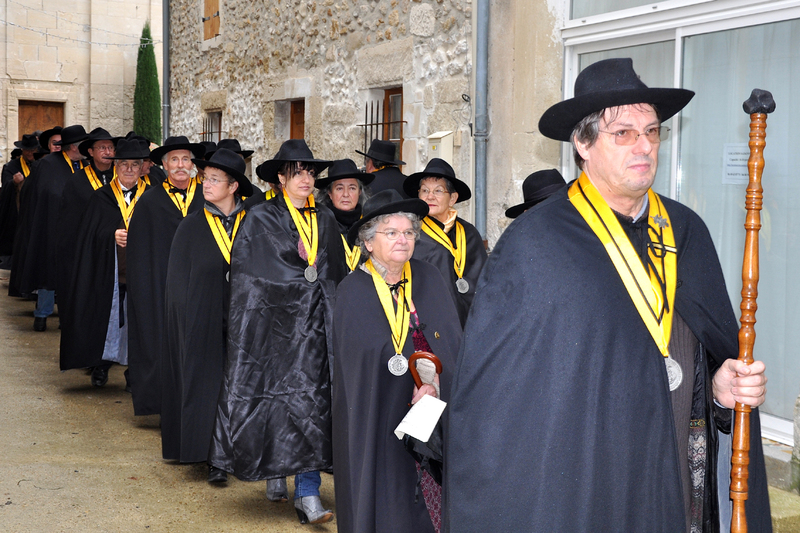 There are a group of men and women based in and around Richerenches called Fraternal Order of the Black Diamond and of Gastronomy, who, dressed in black caps and capes, take the truffles to mass to be blessed, replacing the churches’ incense with that of the musky fungus. The origins of this religious order aren’t clear, but their bright yellow regalia and banners suggest there’s nothing secret about what they do, so the illuminati are safe at the top of the peculiar secret organisation list for now. Despite the controversy surrounding the industry, there are a lot of active communities full of culture and good business. The markets open from November to December. It’s where ‘The Order…’ like to hang out, and there are a lot of events crammed into them. There are around ten truffle markets of note across the region, but within that top list are three that really stand out as the best. These are in Aups, Carpentras and Richerenches, with Aups culminating all their enthusiasm for truffles into a festival in January. Aups hold the 3rd biggest truffle market in France, fetching hundreds of people, both national and foreign, to see what’s on offer. Halfway through their day, though, is a truffle-hunting competition for dogs and their owners. Read more about Mirabeau’s visit to the Aups market. The Friday market in Carpentras is arguably one of the oldest truffle markets in existence. It’s so old that there’s evidence suggesting Raymond V, Earl of Toulouse, banned any other truffle markets in the local area in 1155. Don’t believe how old the festival is? Read the Carpentras Tourist Office brochure on truffle events. 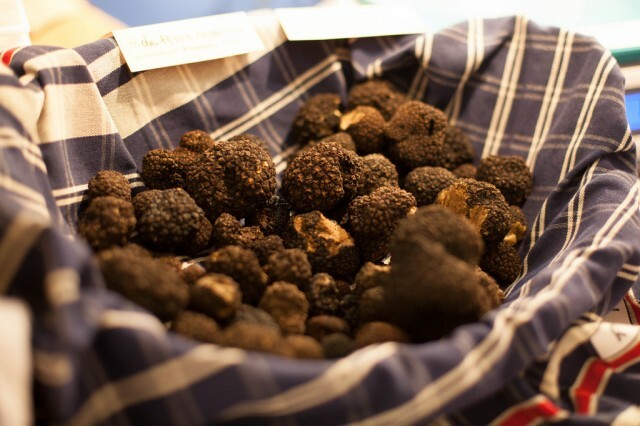 The truffle markets of Richerenches are some of the most blogged-about events of their kind. You can find out a lot about them by simply Googling it, but here are a few of the highlights from the Saturday morning truffle shows. According to Provence Guide, Richerenches is responsible for roughly half the black truffle sales in southeast France, and when you consider truffle sales can be from hundreds to thousands of euros, a lot of cash will be thrown around the markets those days. Provence Guide has more info on Richerenches. The popularity of the event is perhaps emphasised by its surroundings. Richerenches is a walled town built from the original medieval hamlet, creating a beautiful mix of old, and really old architecture. We love hearing about your experiences with these peculiar food, so comment with any stories, recipes or experiences you can share. A really fascinating article. It has whetted my appetite to learn more about this ugly, but intoxicatingly perfumed culinary delicacy. Interestingly, many years ago, whilst walking in woodlands in the Auvergne, near Clermont Ferrand, I came across a black truffle. Not knowing what it was, I tossed it away and continued my peaceful walk!! I wish I could remember the exact location, as there may be more' black gold ' lurking in the shade of the oak trees that flourish in the Auvernat countryside. Great article on such an interesting product. Little to most people know about what goes on behind the scenes of the truffle underworld! I wish there were more photos of the fraternal truffle order. They sound like an interesting bunch. That might be a good or a bad thing, I’ll have to wait till I meet them to decide!